Happy-Gut Tip #01: BELLIES LOVE SMOOTHIES! Welcome to Day 1 of TLC for your gut! Sign up for the email if you want to receive a happy-gut tip every day for the next three weeks. Immediately improve your gut health, and make it easy to love your belly, so that your belly loves you! Bellies love smoothies! Smoothies and protein shakes are me and my family’s go-to favorites for breakfast, lunch, snacks, light dinners, and late-night sustainment. We LOVE liquid nourishment! Smoothies digest immediately, give instant energy, and are perfect while away from home. However, protein is the antidote for carbohydrate and sugar cravings. Protein shakes can protect us from inhaling a bag of chips or a pastry temptation when on the go! I created PROTEIN POWER and ALL DAY ENERGY because I love protein shakes and could not find any without sugar, stevia, gluten, sugar, dairy or whey. PROTEIN POWER and ALL DAY ENERGY are free of all of those! They are naturally sweetened with monk-fruit which has a zero glycemic index and no aftertaste! Happily, both chocolate and vanilla options are delicious when blended with water and ice either solo or added to your favorite smoothie recipe. The recipe line-up below includes a fruity one, a veggie delicious, and a pumpkin pie smoothie—also delicious served as a warm soup on chilly nights. 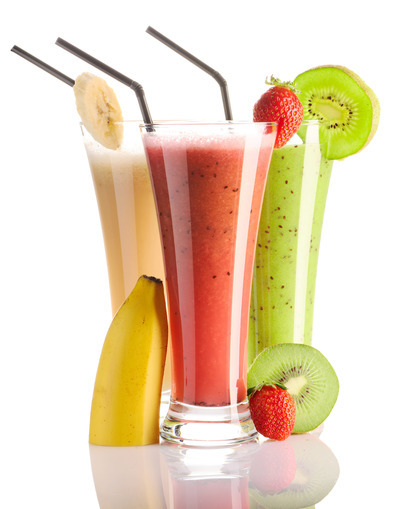 Smoothies are wonderful for those who cannot stomach solid food in the morning. Therefore, if you want to turbo-charge your metabolism, mind, and mood, try a smoothie for breakfast. We sleep better when we have something easy, yet nutritious to digest as a late-evening, guilt-free snack. Blend and serve. This can also be served warm, as a creamy soup, if you omit the ice and heat in a skillet after blending. Happy-Gut Reminder: If you are stressed, skip a meal and drink smoothies for energy instead. Similarly, try our Protein Power blend—a monk-fruit sweetened vegan energy source with 26 grams of protein per serving. Additionally, you may mix Protein Power straight into a smoothie or combine with water for a nutritional and digestive boost. How do busy, health-conscious people meet their important daily protein requirement? Protein Power! A comprehensive, monk-fruit-extract-sweetened, low-allergy-potential dietary supplement designed to support gastrointestinal (GI) function and balanced detoxification. Read more and purchase here!